CAN YOU OR SOMEONE YOU KNOW CONSIDER HELPING? Since our visit to Liberia last January, I cannot forget about these boys. Some have older brothers in our care who are pleading on their behalf. Through God’s eyes, I could see into their hearts. I saw enough gold there, to invest into. EVERY PERSON IS IMPORTANT TO GOD. These young men have the potential to become leaders, if enough caring people come alongside to raise them up. We can see what it has done for our boys at My Father’s House. 4 yrs. later our boys are developing into CHAMPIONS FOR CHRIST! 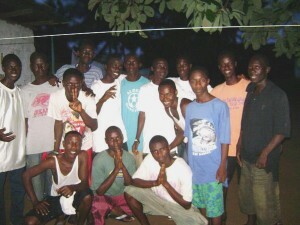 These 20 boys have been raised in the ACFI orphanage in Dixville. We ALWAYS thank God for the blessing you are to the orphans of war, in Liberia! Keep up the good work. From the Daniel Hoover Children’s Village (ACFI orphan village) they graduated to the Shepherd’s Village which was a group home for teen boys, also run by ACFI. Here they continued on with their highschool. Unfortunately the Shepherd’s Village could no longer keep them and that ended their academic schooling. There was simply no funding to continue high school in their state. Tom and Candy Zackey, from New York, opened up a home called OUR HOUSE which provided a home for the boys for another year. Next Kaitlyn MacMillan came to their rescue and founded the BE STILL EMPOWERMENT PROGRAM where many of the boys had the opportunity to go to Trade School and apprentice in a trade of their choice. Some took electronics, electrical, masonry and carpentry. Tools were bought, and they all found a place to volunteer their skills. They have just finished that one year program and are now at this stage. 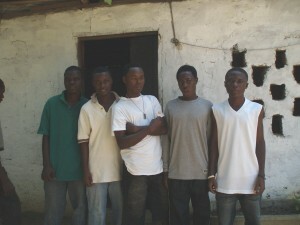 Pastor Jimmie Koffa is the one who is overseeing the boys in Liberia. The Be Still Empowerment Program funded their rooms and basic needs. Jason Nightingale, founder of Wordsower International would send money for food. Now that the BE STILL EMPOWERMENT PROGRAM is finished, I am asking the question WHAT WILL THESE BOYS DO? July their rent is due and they have no money to pay for another year. We can rent these rooms for 20 USD per month and as many as 3 could stay in one room. Let me add that we have EXCELLENT accountability with any funding sent in. EVERY DOLLAR WILL REACH THESE BOYS, and both in the US and Canada you can get a tax receipt for your donations. I have profiles on the boys, if you want one, I can mail or email it to you. Please act immediately, we need your help. In January I went to their little rooms, and saw them with no food, what could I do but reach out and help. You would too if you saw what I saw. THESE BOYS NEED HELP! This is about raising up the next generation to become National Leaders of integrity who will stand for TRUTH AND JUSTICE in this land of blood shed and war. All these boys know is years of civil war. Their parents were killed in the war… and here they are… PLEASE WILL YOU HELP THEM?